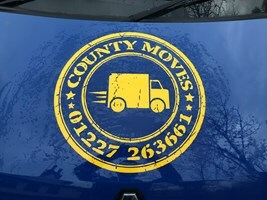 County Moves - Removals/Storage based in Whitstable, Kent. County Moves are a 10-year-old removal company that offer a full domestic or commercial removal service, as well as a fully insured storage facility. We also offer a full packing service and are able to do clearances too. Our two directors who are also long-time friends have over 40 years’ removal experience between them. We pride ourselves on our workmanship and our friendly and fun attitude towards making your move stress free and as easy for you as possible. We are happy to do local, national and now international moves.